Airtherm Engineering have recently completed the new installation of seven natural ventilation systems for Gill Mech Limited based in the West Midlands. Airtherm designed and selected the correct systems to serve a new boxing hall within a newly built pavilion. The project required critical information to establish the correct airflow and terminal size and working closely with both the consultant, builder and mechanical company. 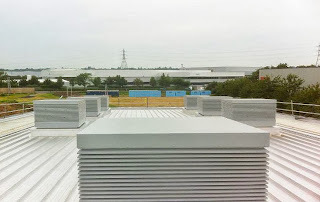 The natural ventilation systems installed have been designed in line with all current publications such as CIBSE guidelines, AM10 Natural Ventilation in commercial buildings and Building Bulletin 101. The terminal sizes were selected by our new computer aided software ‘Wind-iCalc’ and fully conforms to the CIBSE requirements. the stale unwanted air which is expelled through the terminal into the atmosphere. internal structure using universal fixings. and curb mount flashings with suitable upstands. The options for each project are discussed at the design stage, including the necessary openings that are required to suit our systems.